Dude. Seriously. The weather in Michigan this week has been amazing. Like your favorite dessert times a million amazing. Temps have been steady in the upper 70's, with little humidity and lots of sun. Mornings have been cool and calm, a.k.a perfect running weather. I just hope it sticks around for a while. #1. Check out yesterday's Nuun Review and Giveaway, and make sure you enter if you haven't already. Contest is open until Monday, 8/15! #2. Head on over to my guest post at For Two Fitness. You can read all about why I'm still running and racing through pregnancy. Good stuff! If you're not from this great Mitten State, you may not know about the Crim Festival of Races. It's a series of races (duh) held in Flint, Michigan; participants can compete (run or walk) in distances of 1 mile, 5k, 8k, and 10 Mile, with the 10 Mile race being the true bread and butter, IMO. There's even a wheelchair division, team category, and the ever-adorable Teddy Bear Trot for the kidlets (which LBA will so being doing in the future!). The race is very well organized, has a huge field (they even fly in some elites from Kenya), and a very awesome afterparty. I've been known to drink my 10 miles in beer at the post-race party. A group of us did the 10-mile race last year, and this year will be our fourth consecutive Crim. I'm pumped! This year, however, I'm going into the race with a different perspective than before. Since I'm not paying attention to time, and I'm still working on my easy pace every day, I have a few plans in mind as I train for the race. 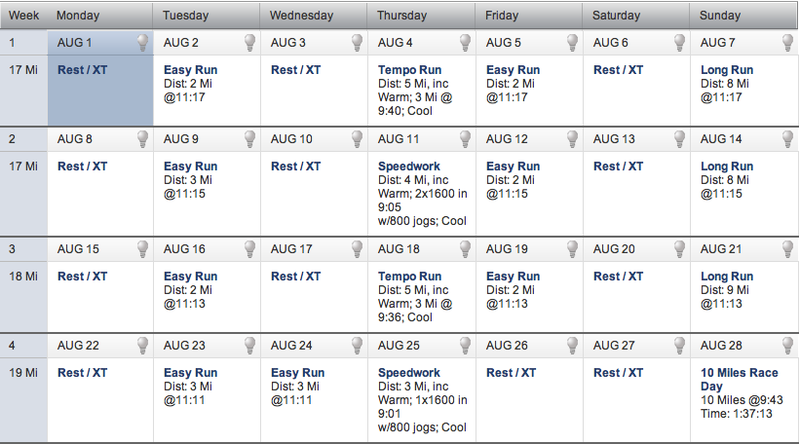 Adhere to my training schedule - somewhat. I used the Runner's World SmartCoach tool to build myself a 4-week schedule, but I've only been using it to keep track of mileage. Tempo and speed workouts are ignored, and I don't pay attention to pace. I just run. Note: this is a fairly short training plan for a race of this distance, but since I'd already been running roughly 10-15 miles most weeks, I felt I had a good enough base to use a 4-week plan. Learn to be flexible with mileage and days on which I run. I've found that my body doesn't always respond well to pounding pavement now that I'm pregnant, so if I'm not feeling the run one day, I'll just shuffle it to the next day. The schedule isn't so tight that I can't move around in it (unlike my favorite pair of Gap skinny jeans, which are barely held together with a hair tie as I write this). Practice race day pacing during my training runs. Incorporating walk breaks into my runs has been something I've worked on the last few weeks. It seems that running 2 miles, then walking for .1 miles is a good ratio; I'm rested enough to continue on for another 2 miles without breaking for so long that my body shuts off running mode. I'll continue that plan on race day by breaking up the 10 miles into 2-mile increments with the .1 mile walk break in between; in addition, I plan to walk through every aid station for hydration and rest. Run for fun with friends! As much as I'm hankering to run a full marathon right now, it's been really nice to not worry about time and splits and total distance and age group finishes and PRs this summer. Racing for fun reminds me why I love running: It brings me together with people who heart running just like me. But don't think for a second that I won't miss the beer at the post-race party this year. Wah-wah. What's your favorite post-race treat? Have you ever had to alter your race plans? What did you do?